Hailing from a small village in Maharashtra, Holle graduated from Abhinav Kala Mahavidyalaya, Pune. During his Diploma he mastered the skill of portrait painting and did figurative painting but it was strictly due to need of curriculum. He was always inspired by paintings of Gaitonde and abstraction was always a passion and fascination for him. This promising artist has truly remained faithfully to his passionate spontaneous painting related to elements from nature. In his latest exhibition called ‘Place and Space’ held at Jehangir Art gallery from 04th April to 10th April was a visual treat and meditative experience. This time he spread on his canvas the vast galaxy which is million kilometers away from our planet, a part of nature which is unbounded, indispensable yet remained to be explored at its fullest and yet fascinating to us. Its thoughts and images mystify us. It a womb where millions of stars, known and unknown planets are born and it is a womb that gave birth to our own Earth, which again like its creator has so many mysteries, beauty and mystical secrets hidden in it. Earth changes its makeover with every region, season and natural changes. It is always a visual joy to experience changing makeover of nature. The Galaxy above earth seems to act as a hanging mirror and reflects characteristic of nature in every phase and colour. Holle has tried to capture this in his paintings. His abstraction is always unwinding different aspects of nature. This may be because he opened his eyes to see the world in a small village with natural setting, a village called Aalandi in the lap of Bhimashankar mountain in Maharashtra. Nature still dominates his place of birth and it is still away from urbanization. Holle now lives in midst of city hustle bustle where there is no breathing space, it has luxury, but that demands ones rightful leisure time, privacy. It is difficult to find trust, contentment and happiness in true sense. The paintings are perfect getaway from this obvious unavoidable stress in life. They are meditative in nature. Splash and swirls of colours seems spreading in rhythmic pattern highlights artist’s love for music. Along with the aura of musical compositions , there is a lavish use of colors of nature like blue and grey depicting clear and cloudy sky or blue water and shinning sand, variation in green of trees and plants, red, gold and other bright colors stand for birds, animals, flowers and so on. In some paintings there is a glitter in midst of grave dark background and this is his fascination for observing clear sky during dark nights that he usually observed when he stayed in village and slept in courtyard of his house, this beauty of nature has made permanent impression on artist. Holle confesses of having magnetic attraction towards ‘light’ in nature and its shine either in sky, on water or its ‘oasis’ effect on stretched shores. Idyllic settings are the undetachable from his paintings. His paintings act as mode to escape from social turmoil for some time and have meditation like effect to make one relax. Person is bound to go in trance and feel light and peaceful. The present chaos in the world caused by natural calamities, advanced technology and energy used to produce dangerous and destructive weapons for mass destruction, unhealthy competitions among countries and people, poverty and likewise reasons seems to have stimulated Holle to present swirls, splashes charged with emotions something that is nice to eyes, mind and soul. 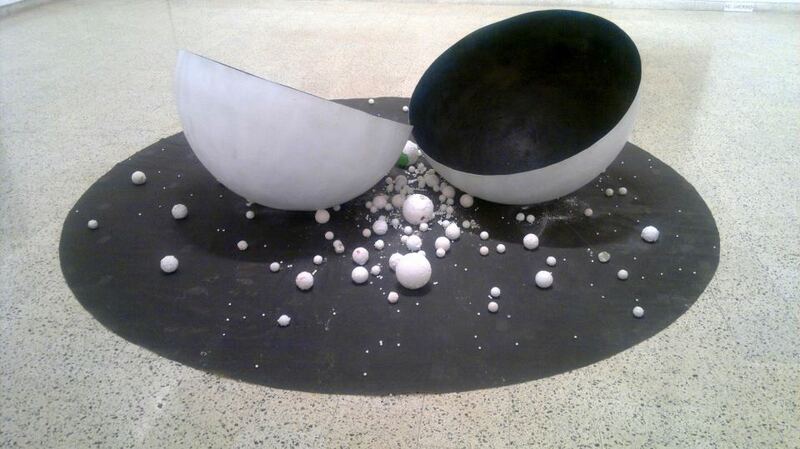 Installation is also significant as it represents Nebula from which millions of small and big stars are born, all of them having their own DNA and some of them so powerful that they are said to influence human existence on this planet. 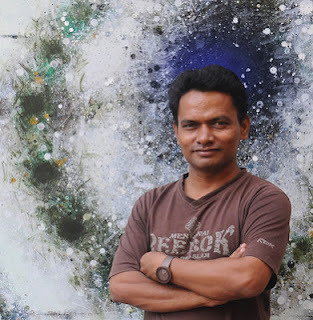 After college, he fully engrossed himself in abstract painting and today he is most coveted young abstract painter from Mumbai and Pundole Art gallery patronize his creation. 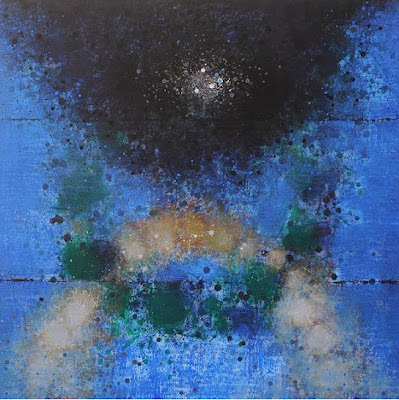 His work is exhibited in almost all the reputed galleries in India and his paintings have been awarded and have the honor of being collection at N.C.P.A. Mumbai, Torent House Ahmedabad, Sir J. School of Art Mumbai, Apparao Galleries, Chennai, private collectors and many other collection in India. Holle has a long way to go as he says he doesn’t know what lies in future and which new makeover of nature and earth will be projected in his next creations, but he is confident of coming up with something beautiful and peaceful.